IT organisations are rethinking their early cloud strategies. They need to prioritise requirements of the business and internal customers/users in order to "right-size" their approach. We review often-observed cloud challenges while outlining five fundamentals of sound cloud services for design for data management. It should come as no surprise that cloud computing is having a substantial impact on businesses and the IT organisations that support them. Our research of IT executives in June 2014 indicates "the cloud" already consumes nearly 45% of the average IT budget, and it will increase nearly 60% in only two more years. See Figure 1 below. Depending on who you talk to within your organisation, from the CIO, the CMO, a line of business owner, or even IT staff, "the cloud" is described differently; making it hard to achieve consensus and even more difficult to deploy. 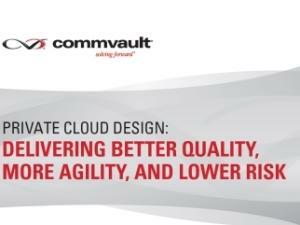 When a common cloud definition isn't articulated clearly in an organisation, it becomes extremely challenging to design, deploy and operate successfully. Therefore it is critical that all stakeholders, both business and technology focused, are in agreement about cloud implementations and what appropriate outcomes will look like through time.